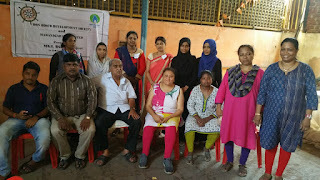 13-April-2018, Mumbai: The Don Bosco Development Society (DBDS), organized a free health check-up camp for the Women and children in Ashok Nagar slum (Kurla). 176 children and women were examined by the doctors in this camp held under the aegis of ‘MGL Disha Project’ supported by Mahanagar Gas Ltd.
Mr. Nishant Sinha (CSR Manager) and Mr. Vinod Negi (Assistant Manager – CSR) both from Mahanagar Gas Ltd. graced the occasion and inaugurated the health camp. 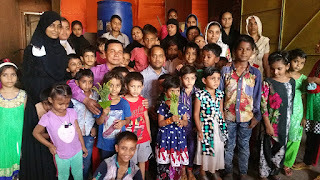 They also interacted with the children and teachers of the support classes which are running daily in the slums of Ghatkopar and Kurla as part of MGL Disha Project too. Mrs. Surekha Pednekar (Project Officer - DBDS) welcomed all the General Physicians and the Para-medical staff for this camp. The purpose of health camp was to identify anaemic children and women in the slum. Patients were screened for anaemia using a symptoms questionnaire. This camp was held in association with Larsen & Toubro LTD in Andheri. Dr. Dinesh Badani & Dr. Smita Trivedi along with 1 Nurses and 2 Medical Social workers examined the patients during this health camp. Ten women and teacher volunteers from the slums itself were extremely helpful as they helped in: arranging facilities, visiting slums and informing people about the health camp and managing the crowd. “We are very grateful to Don Bosco for this service – if not for them we would have never received such a great help,” said Mrs. Guddi (one of the beneficiary of the health camp). Mrs. Zarina Khan (DBDS – Staff) along with the DBDS team organized this Health camp; she also proposed the vote of thanks at the end.